This little gem is one of the new places that has popped up along Elizabeth street beneath the Argus Building since the start of 2015. Walking past, we weren't sure what it was about, and couldn't read any of the signs to help us. Still, we were feeling adventurous. We sat down and made what we could of the menu, settling on the ribs option. When my husband went to order though, they were out of ribs, and the server explained that the mystery sign on the wall saying "Hot hot hot, 500g for $9.8" in fact related to building your own hot pot (not an option on the menu). We were ushered around the corner, beside the kitchen and pay station, and saw a line of fresh food and a fridge section. I was immediately excited – I love a buffet!! I love seeing all the options and getting to try new things. 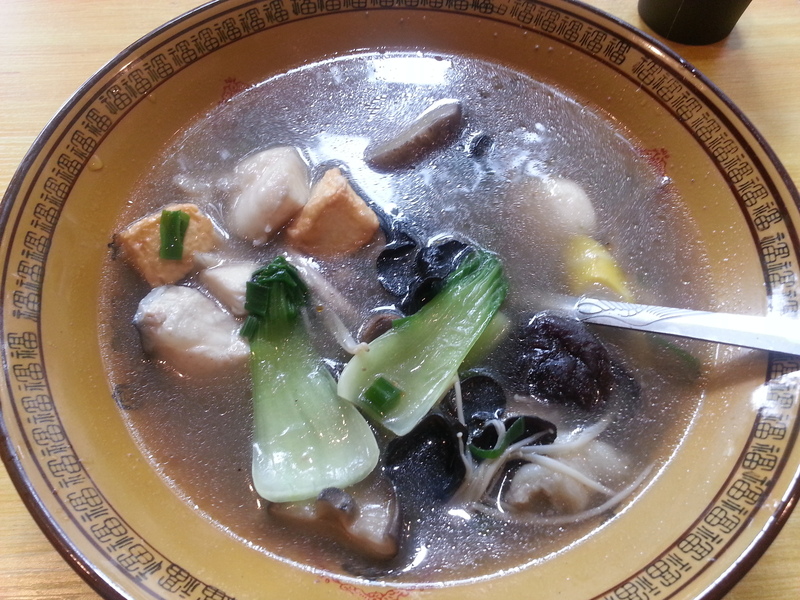 The server explained that we could choose our ingredients, then they would add the soup and cook it. The cost was decided by the weight of the ingredients (not the soup). If you got 600-700grams worth of goodies, it would cost you $11.80, but up to 500grams was only $9.8, so that's what we aimed for. We both had to go back and fill up some more to reach the 500grams. This is my initial bowl of goodies. We chose between 4 soup options – original, mild, hot and extra hot. I went for original, since my spice-bar is set very low. My hubby was more daring – he went for mild. He loves his spice, so I was sceptical that he'd be happy with the heat level, but thank goodness he didn't go any hotter. The 'mild' soup had him puffing and sweating when it arrived in a nice bowl 5 minutes after we'd handed over our ingredient selections. The food was tasty and fresh, but the fun part was discovering what you'd actually put in your meal. Many of the 'balls' (no other way to describe them!) contained fillings. We weren't sure what the outside was – some kind of meat substitute or tofu creation. The fillings were tasty, though since we only tend to eat mainstream Asian food, the flavours were unfamiliar, therefore more exciting. 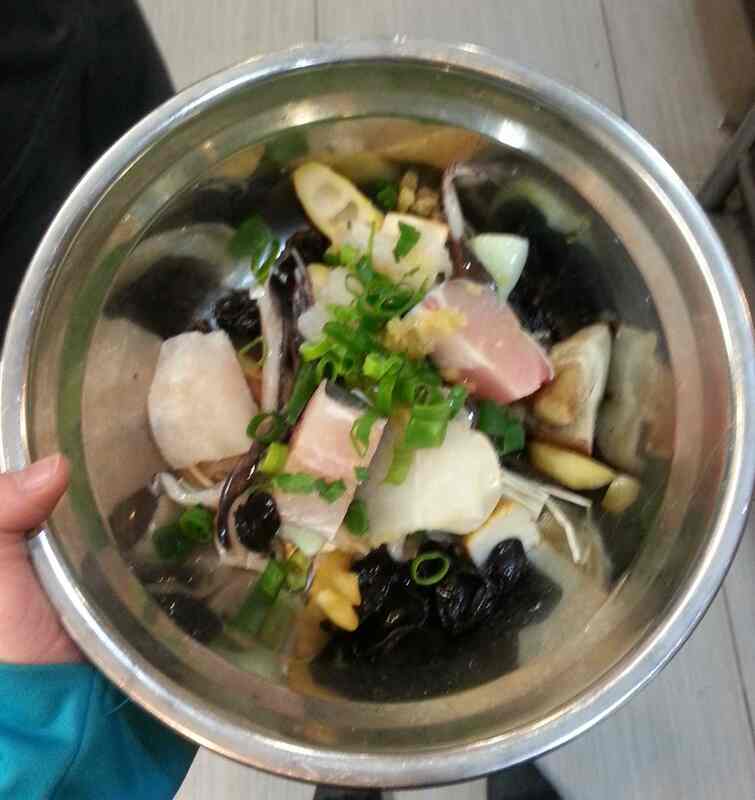 The foods included a row of pickled things, nuts, seaweed salad, and a fungi salad. 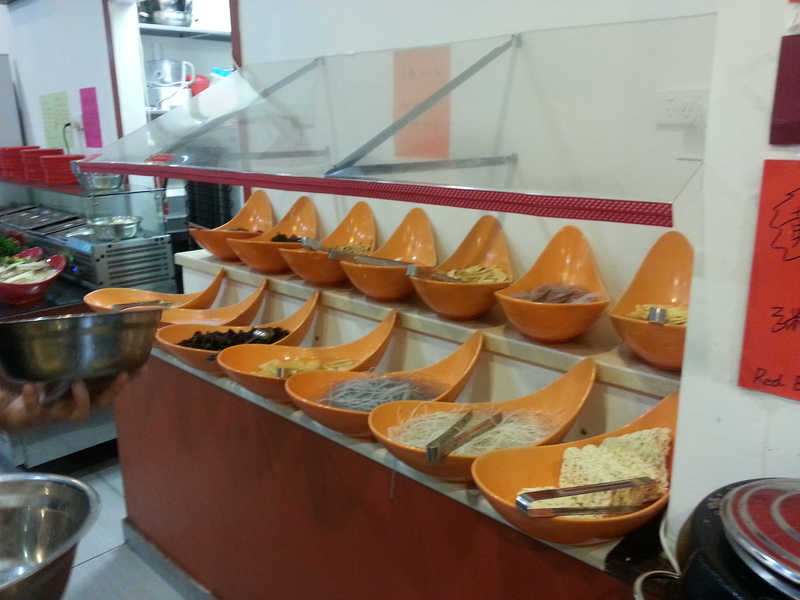 There was a huge range of different types of noodles to add, as well as several kinds of mushroom. I loaded up on the shitake and enoki mushrooms. There were some token greens, which are always nice for a garnish, then a table of sauces and seasonings which included basics like garlic and shallots, sesame oil, sesame paste and vinegar, as well as some more exotic ones like leek paste (I wasn't brave enough to try this, though I wish I had). The fridge area was the next patch of excitement. 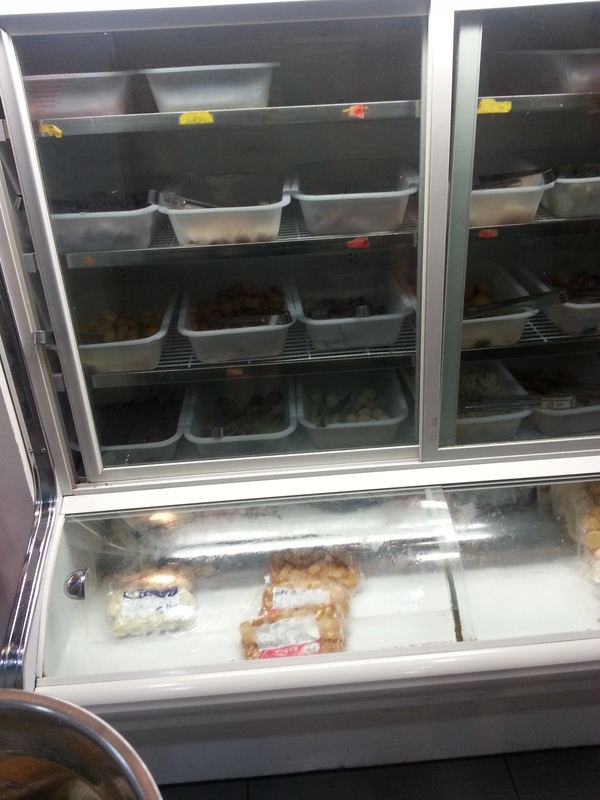 While there were small tags on the shelves, they weren't in English, so almost everything in here was a mystery, expect for the chunks of fish, the octopus, and the prawns. 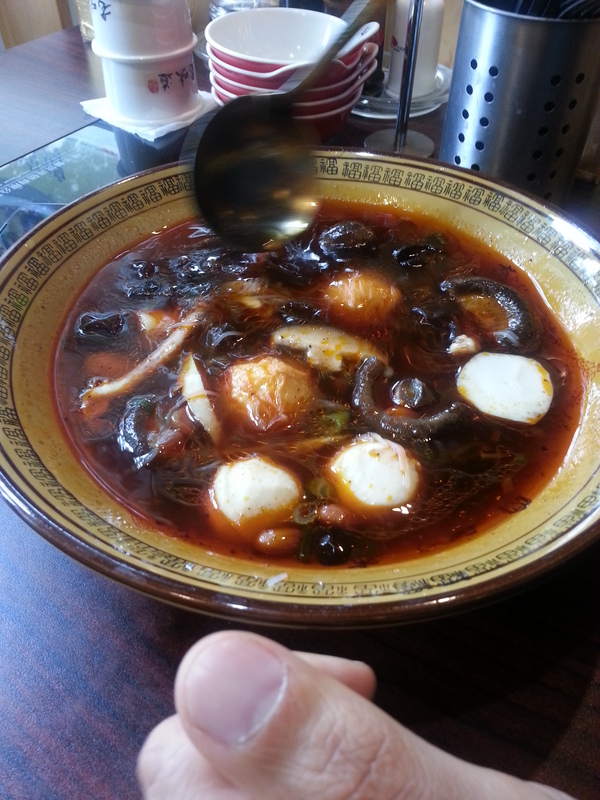 Alongside the seafood was normal seafood extender, then a huge range of balls and tofu chunks. I can't wait to go back and make another concoction. Next time I plan to go for the $25 per person buffet hot pot, because then I can try EVERYTHING, one at a time. This option gives you a large pot that sits on the heating plate built into every table. You go and get plates of food to put into your hotpot, and cook as you go. There are also a few complimentary drinks for the $25 deal, though these seemed to be just a cordial and a red bean juice of some kind. Looking online, it's very difficult to find reviews and extra information about this place. The reviews I can find seem to be reviewing a totally different menu, even though the photos look like the same place. I'm not sure how long the menu has been like this, but I highly recommend going for the fun of creating your own unique hot pot experience.